This article is about the daughter of Oedipus. For the daughter of Eurytion, see Antigone (daughter of Eurytion). For the play by Sophocles, see Antigone (Sophocles play). For other uses, see Antigone (disambiguation). 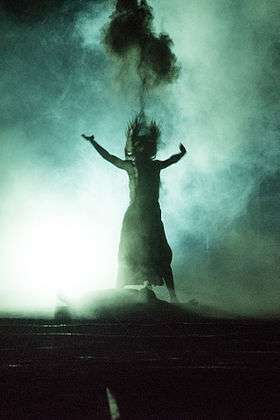 Antigone is burying her brother Polynices by throwing ashes in the air, Burgtheater 2015. Antigone is the subject of a story in which she attempts to secure a respectable burial for her brother Polynices. Oedipus's sons, Eteocles and Polynices, had shared the rule jointly until they quarrelled, and Eteocles expelled his brother. In Sophocles' account, the two brothers agreed to alternate rule each year, but Eteocles decided not to share power with his brother after his tenure expired. Polynices left the kingdom, gathered an army and attacked the city of Thebes in a conflict called the Seven Against Thebes. Both brothers were killed in the battle. King Creon, who has ascended to the throne of Thebes after the death of the brothers, decrees that Polynices is not to be buried or even mourned, on pain of death by stoning. Antigone, Polynices' sister, defies the order, but is caught. 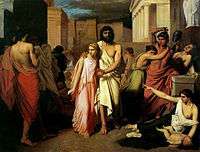 In the oldest version of the story, the burial of Polynices takes place during Oedipus' reign in Thebes, before Oedipus marries his mother, Jocasta. However, in other versions such as Sophocles' tragedies Oedipus at Colonus and Antigone, it occurs in the years after the banishment and death of Oedipus and Antigone's struggles against Creon. Antigone is brought before Creon, and states that she knew Creon's law regarding no mourning for Polynices but chose to break it, expounding upon the superiority of 'divine law' to that made by man. She puts the will of the gods ahead of man-made laws, responding to the decision of not granting Polynices a burial with courage, passion and determination. Sophocles' Antigone ends in disaster, with Antigone being locked in a tomb on Creon's orders. Although Creon has a change of heart and heads to the tomb to release Antigone, Creon's son Hæmon (who was engaged to Antigone) stabs himself after seeing that Antigone has hanged herself in the tomb. Queen Eurydice, wife of King Creon, also kills herself following her son's death. She has been forced to weave throughout the entire story and her death alludes to The Fates. The dramatist Euripides also wrote a play called Antigone, which is lost, but some of the text was preserved by later writers and in passages in his Phoenissae. In Euripides, the calamity is averted by the intercession of Dionysus and is followed by the marriage of Antigone and Hæmon. Antigone also plays a role in Euripides' extant play The Phoenician Women. Different elements of the legend appear in other places. A description of an ancient painting by Philostratus (Imagines ii. 29) refers to Antigone placing the body of Polynices on the funeral pyre, and this is also depicted on a sarcophagus in the Villa Doria Pamphili in Rome. 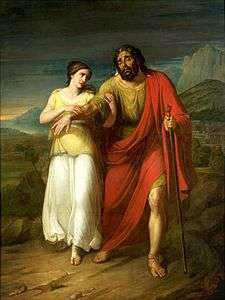 And in Hyginus' version of the legend, founded apparently on a tragedy by some follower of Euripides, Antigone, on being handed over by Creon to her lover Hæmon to be slain, is secretly carried off by him and concealed in a shepherd's hut, where she bears him a son, Maeon. When the boy grows up, he attends some funeral games at Thebes, and is recognized by the mark of a dragon on his body. This leads to the discovery that Antigone is still alive. The demi-god Heracles then intercedes and pleads with Creon to forgive Hæmon, but in vain. Hæmon then kills Antigone and himself. The intercession by Heracles is also represented on a painted vase (circa 380–300 BC). In the works of Hegel, in particular in his discussion of Sittlichkeit in his Phenomenology of Spirit and his Elements of the Philosophy of Right, Antigone is figured as exposing a tragic rift between the so-called feminine "Divine Law," which Antigone represents, and the "Human Law," represented by Creon. The psychoanalyst Jacques Lacan writes about the ethical dimension of Antigone in his Seminar VII, The Ethics of Psychoanalysis. Others who have written on Antigone include theorist Judith Butler, in her book Antigone's Claim, as well as philosopher Slavoj Žižek, in various works, including Interrogating the Real (Bloomsbury: London, 2005) and The Metastases of Enjoyment (Verso: London, 1994). A new translation of Antigone into English by the Canadian poet Anne Carson has been used in a production of the play produced by BAM (Brooklyn Academy of Music) and put on at the BAM Harvey Theatre in Brooklyn, New York. The performance features Juliette Binoche as Antigone, with Ivo van Hove as the director. The play ran from September 24 to October 4, 2015. This article incorporates text from a publication now in the public domain: Chisholm, Hugh, ed. (1911). "Antigone". Encyclopædia Britannica (11th ed.). Cambridge University Press. ↑ Scott Smith, R.; Trzaskoma, Stephen; Pseudo-Apollodorus; Hyginus (2007). Apollodorus' Library and Hyginus' Fabulae: two handbooks of Greek mythology. Indianapolis: Hackett Publishing. p. 122. ISBN 978-0-87220-820-9. ↑ Heydermann, Heinrich (1868). Über eine nacheuripideische Antigone [On a post-Euripideian Antigone] (in German). Berlin: Adolph Enslin. ISBN 978-1-160-28969-6. OCLC 601932362. ↑ Sophocles; Jebb, R. C. (1890). Sophocles: The Plays and Fragments. Cambridge: CUP Archive. ↑ Brecht, Bertolt (1948). Antigonemodell 1948 (in German). Berlin: Gebrüder Weiss Verlag. LCCN 50056426. OCLC 1456885. ↑ Charles Spencer (31 May 2012). "Antigone, National Theatre, review". Telegraph.co.uk. ↑ "Antigone". Canada: Internet Movie Database. Retrieved 3 February 2013. ↑ Antigone at Brooklyn Academy of Music. Antigones by George Steiner. An examination of the legacy of the myth and its treatment in Western art, literature, and thought in drama, poetry, prose, philosophic discourse, political tracts, opera, ballet, film, and even the plastic arts. Steiner, George (October 1996). Antigones – How the Antigone Legend Has Endured in Western Literature, Art, and Thought. New Haven: Yale University Press. ISBN 978-0-300-06915-0. LCCN 96060411. OCLC 318365852. Antigone's Claim: Kinship Between Life and Death by Judith Butler. An examination of the figure of Antigone in literature and philosophy, particularly in Sophocles and in the work of Georg Wilhelm Friedrich Hegel, Luce Irigaray and Jacques Lacan. Butler, Judith (2000). Antigone's Claim: Kinship Between Life and Death. The Wellek Library lectures. New York: Columbia University Press. p. 88. ISBN 978-0-231-11895-8. OCLC 43951993. Retrieved 24 May 2011. Söderbäck, Fanny, ed. Feminist Readings of Antigone. New York: SUNY Press, 2010. ISBN 978-1-4384-3278-6. Including classical texts by Judith Butler, Bracha Ettinger, Julia Kristeva, Luce Irigaray and Adriana Cavarero. Wilmer, S. E., and Zukauskaite, Audrone, eds. Interrogating Antigone. Oxford: Oxford University Press, 2010. ISBN 978-0-19-955921-3. Including recent texts by Judith Butler, Bracha L. Ettinger, Julia Kristeva and Luce Irigaray.